Set it up in there, would be awesome. Thats awsome. Those Guys rock! Look, Kinect is the new iPhone! The resolution could be improved, the limit is 1024 PWM leds driven (64 MAX7313 x 16 leds) on each I2C bus. We did not claim hacking the kinect, we wanted to use the fresh open drivers as depth measurement to render it on our ledwall. And really big thank’s to the DDF team who inspire us this collaborative work and all the people working on liberating the kinect. A regular camera would only be able to capture colour/tone and brightness. 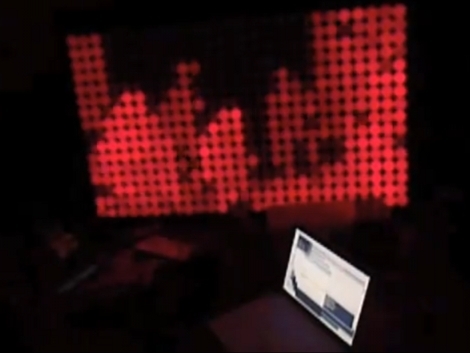 Kinect detects 3D, so the closer you are, the brighter the LEDs will be on the wall.